Did you know it is possible to have a dental crown created and permanently placed in just one visit? Normally if you have a chipped or cracked tooth that needs to be rebuilt it would take several visits to the dentist before you would leave with your new permanent crown. But thanks to advanced dental technology, this has changed. CEREC® is the new dental technology that allows this quick process to happen. It is one of the most useful advances in dentistry at this time and Morgan-Hill Dental Care can provide this shortened procedure to you. 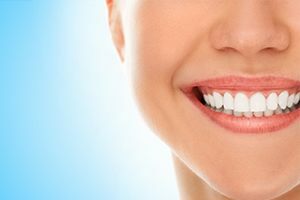 In only one visit we can use this new technology to restore your damaged teeth to their natural beauty with permanent dental crowns in only one visit to our dental office. Why Choose Morgan-Hill Dental Care for CEREC® Same-Day Crowns? CEREC® (CERamic REConstruction) is the process that gives us the ability to avoid sending you home with a temporary crown only to return a couple weeks later to have it removed. Temporary crowns can be eliminated with this technology. At the average dental office, an impression of the needed crown location is made at your first visit and mailed to a dental lab while you go home with a temporary crown. Sometimes those temporary crowns can be uncomfortable. After about two weeks the permanent crown is received. A second visit is made in which the temporary crown is removed and the permanent crown is attached. Now that has all changed! This can be done in one day, at one visit to our office. Normally an impression would be made of the location where the crown is needed, but with this new technology, the process is different. A picture is taken using a special camera. Then, using specially created software, it is converted to a virtual 3D model. 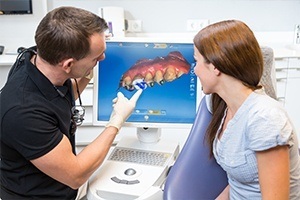 Using an extensive database and comparing the surrounding teeth, this software is able to determine the best shape needed for the ceramic replacement. Next, the dentist or technician will use CAD/CAM technology to design the new restoration on the computer including every detail. This digital version of the crown or onlay is then sent to a milling machine which creates out of ceramic the replacement in the perfect color to match the surrounding teeth. Once finished, the restoration is polished beautifully. The dentist then bonds the crown or onlay to the natural tooth. The process is complete and the new tooth is ready to be used immediately. There are many advantages to using this process as opposed to the old way. The most obvious benefit is having it all done in one office visit. While you wait comfortably in the office, your restoration is created to fit your need in detail. Having a CEREC® allows you to have a “false” tooth without anyone but you even knowing. The restoration is created using a metal-free, tooth-colored ceramic material that mimics your natural teeth. Another benefit of CEREC® restoration is that it allows the dentist to preserve more of the healthy tooth than the old process would allow. Keeping more of the natural tooth material creates a stronger and more conservative result for you.